When I bought new chairs for our dining table it never occurred to me until I brought them home that our unfinished wood table would suddenly look orange. I lived with it like that for a while but just couldn't take it anymore. I tried a pin on pinterest to age the wood using steel wool and vinegar. 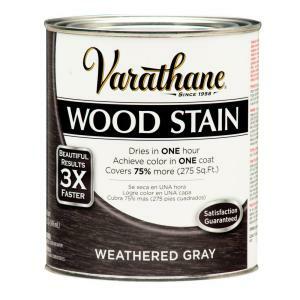 So, off to Home Depot I went and I came home with a $4 can of weathered grey stain. It was the perfect color. I love how they actually go together now! 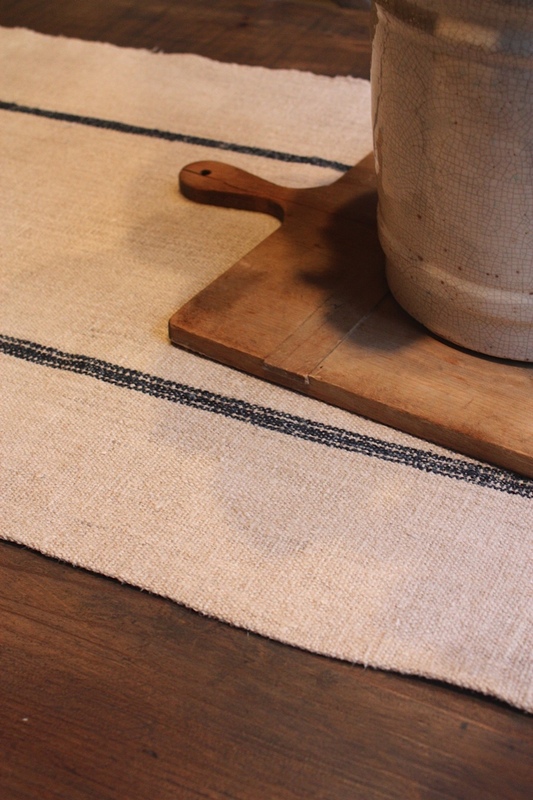 I got the grain sack table runner from Dreamy Whites. I have a slight crush on it. Better Homes and Gardens magazine. I love it though and it was very inexpensive. I fell in love with the house in the magazine. It was neutral with bits of orange. As you can see, I hopped on that train too and added a vintage educational chart from one of my favorite shops Joyworks. It has just the right amount of orange. Here is a side by side with the before on the left. $20 including the stain and the wax stripper. I hope you like the after! FREE SHIPPING IN MY ETSY STORE ENDS TOMORROW! 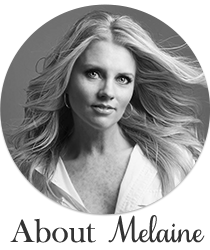 I HAVE A LOT OF QUESTIONS ON PRODUCTS USED, SO HERE WE GO! I USED THIS GEL STRIPPER ON THE TOP WHERE I HAD PREVIOUSLY APPLIED WAX. TOOK IT RIGHT OFF, NO HARSH SMELL. STAIN COLOR IS WEATHERED GRAY. I SIMPLY BRUSED ON AND WIPED OFF WITH PAPER TOWELS. What a difference! 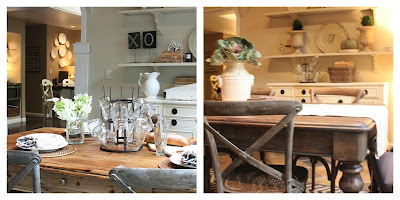 Love the stained table and the chairs are so neat! I pinned one pic to my before and after board! Hi Hannah! Yes, I used a citrus stripper. You let it sit for 30 min and wipe off, no smell~awesome! 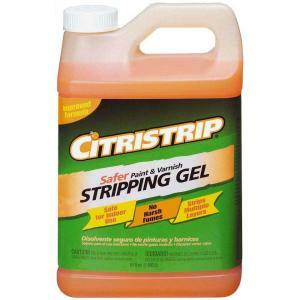 It's called citristrip and I got it at home depot! Hope this helps! LOVE. can you let me know what brand color stain you used? I had a new couch come yesterday and all of a sudden I hate the pine in the room. Never looked orange but now it does and I can't afford to not like you wood! I would be so grateful! love the subtle change with the stain. Brand of the stain you used? Love this grey stain...just fabulous. Would love to have this finish on a walnut side table that I want to redo. Guess I should try stripping the walnut finish off first. But what do I have to lose. Adorei sua mesa e as cadeiras ficaram lindas. Bonito seu arranjo de mesa nessa tabua. Thanks for the tips. 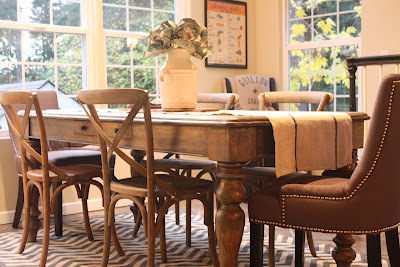 Your "new" dining room looks great! Awesome! Love how that turned out. I love the look of wood stained a color like that. The table looks rich & divine and the rug...Oh my! LOVE! I didn't think I could like your table more, but I do. I'm thrilled to see you had good luck with that stain. We bought the exact same can to use on a bed my husband is making for our son, and I've yet to try it ... Was hesitant that it might not turn out well. Love the results you had with it! Would you mind saying where you got the rug? I love it and if it's inexpensive I would like to get one. Thanks! 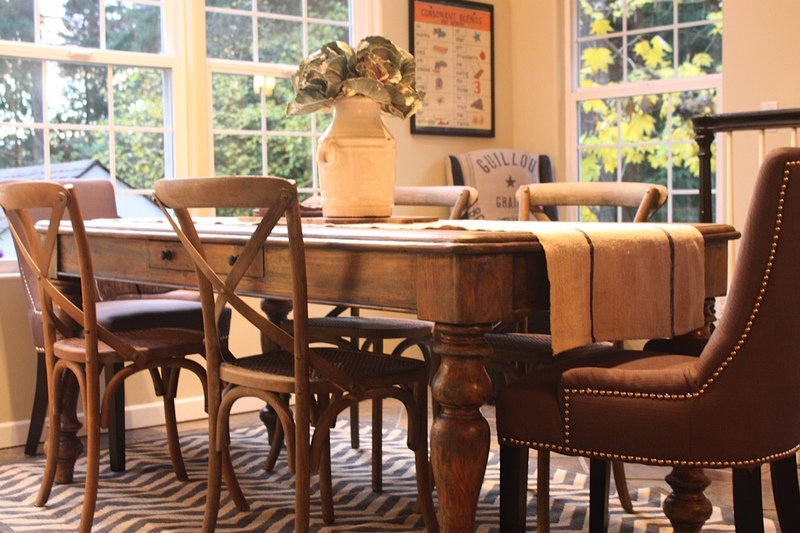 Dining Room Furniture needs to be exclusive for your house. 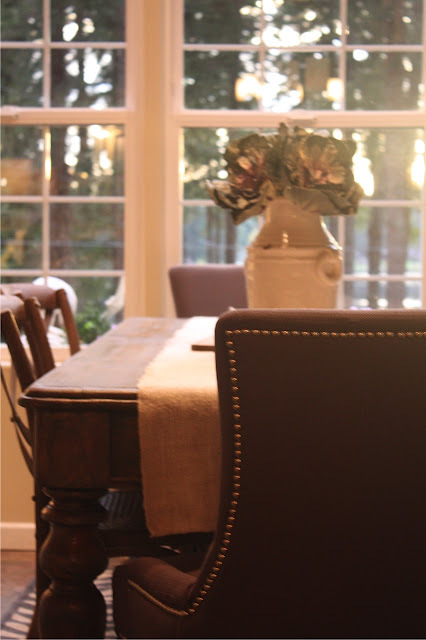 The dining room is an area where whole family sits together and share daily activities with good food. Awesome!!! I love your chart. I like those chairs.looks fascinating to me.